A boy’s fear of playing his trumpet at his first concert nearly overwhelms him until he confides in his mother. 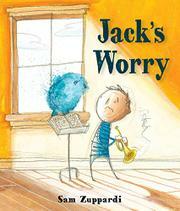 Jack loves playing his trumpet and looks forward to his “first-ever concert,” but on concert day he wakes with a Worry. Jack tries hiding under his blanket and his bed, but his Worry follows him. With his Worry in tow, Jack can’t enjoy the special breakfast his mother has made. He runs around the yard and plays his trumpet, but his Worry remains. Eventually, a distraught Jack confesses he doesn’t want to go to the concert because he’s afraid of making a mistake and his mother won’t love him anymore. When she assures him she’ll love him even if he plays “every note wrong,” all ends on a high note. Whimsical pencil-and-acrylic illustrations use swift, sketchy lines and color washes to visually take Jack from confident anticipation to debilitating fear. Before his Worry arrives, Jack appears center-page, self-assuredly playing his trumpet with notes joyously swirling across the page. Then Jack’s Worry appears, first as a small, somewhat-innocuous, blue-green blob, quickly morphing into a large, dark, ominous, overshadowing presence, sapping Jack’s confidence. However, once Jack confronts his Worry, it shrinks, leaving him smiling and empowered. Jack and his mom are white, but his friends and orchestra-mates are nicely diverse.